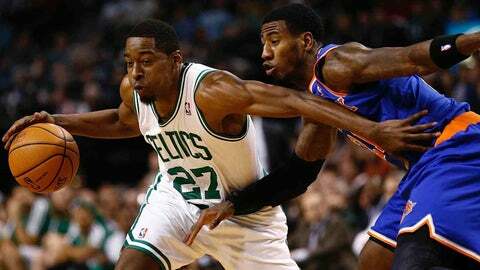 Boston, MA, USA; Boston Celtics shooting guard Jordan Crawford (27) dribbles the ball around New York Knicks shooting guard Iman Shumpert (right) during the second half at TD Garden. Nine teams in the Western Conference sport winning records. A 10th (New Orleans) is .500 entering Tuesday’s games. In the East, three teams possess winning records. One of those three (Atlanta) is just a game over .500. This type of disparity is all the NBA rage among reporters and fans. But it’s not lost on the players, either. "If you look at the Western Conference, the quality so high," Dallas Mavericks forward Dirk Nowitzki told Yahoo Sports. "The teams are bunched up right there. We can beat each other every given night. It’s not like the Eastern Conference, where you just roll through." Ah, yes. The Eastern Conference: Where the Cleveland Cavaliers can put together a 9-14 start and still sit just three games behind the Hawks for the No. 3 playoff seed — and just one-and-half games behind Boston for the fourth spot. Of course, more than 55 games remain for everyone in the NBA. The regular season doesn’t end until mid-April. Lots of stuff can happen. Right now, practically everyone not named the Milwaukee Bucks in each conference has a chance. It’s just, as Nowitzki pointed out, that chance is significantly less difficult to achieve if you play in the East. "We got to compete every night (in the West), especially if you want to win on the road," Nowitzki told Yahoo. "You’re going to be in a lot of close ones." Houston center Omer Asik is expected to be traded by Thursday, and several league insiders believe Philadelphia is the leading candidate to obtain him. It is unclear what the 76ers may offer in return, although names such as center Spencer Hawes and forwards Evan Turner and Thaddeus Young are mentioned most. Oklahoma City, Boston, Milwaukee and Atlanta are considered other potential destinations. It is believed the Rockets would prefer to trade Asik to the Eastern Conference — although GM Daryl Morey is looking for the best possible gain first. If that means the trade partner is in the same conference, or even same division, so be it. — Celtics guard Jordan Crawford is available, according to multiple league sources, and Miami is one team that would like to nab him in a deal. But don’t rule out Sacramento, Toronto and New York, said one NBA executive. — Hawks forward DeMarre Carroll defended Los Angeles Lakers star Kobe Bryant for most of their game Monday, the Hawks coasting to a 114-100 win. Carroll hounded Bryant the entire length of the floor, and Bryant shot a miserable 4-of-14 for eight points. "That’s why I wanted to pick him up full-court, to get his legs tired," Carroll said. "His shots were falling short because his legs were tired." — The 114 points, by the way, were a season-high for the Hawks. Yet another example that the Lakers have been atrocious defensively. They’re 29th in points allowed (103.9 per game). — Brooklyn guard Joe Johnson went 10-of-14 on 3-pointers in a route of Philadelphia. That was an NBA season high in threes. Teammate Kevin Garnett was impressed — but indicated he’s seen it all before. "I’ve been in the league since like Moses," Garnett said. "Not too much I ain’t seen." I’ve been in the league since like Moses. Not too much I ain’t seen. — That’s right, the Sixers gave up 139 points to Portland and 130 to the Nets in their previous two games. It’s safe to say they’re coming apart after a surprising start. On the bright side, Sixers coach Brett Brown said rookie guard Michael Carter-Williams could return from a skin infection within the week. Carter-Williams has missed seven straight. — Through 24 games, all of Indiana’s games were decided by five points or more. They were the only NBA team that could make such a claim. — Orlando forward Glen Davis compiled a 14-point and 11-rebound double-double in an 83-82 win at Chicago, while helping limit Bulls forward Carlos Boozer to six points on 3-of-10 shooting. "I like playing against Boozer. He really fires my engine," Davis said. "Just his whole attitude really gets under me."